This year’s scholar’s lunch at the Rotary Club of Warwick had a purple theme. 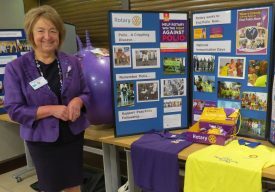 When young students from local secondary schools joined Rotarians for the annual scholar’s lunch recently, the Rotarians were all wearing something purple! Purple is the theme of Rotary’s global campaign to eradicate polio, and after lunch Margaret Morley, Polio ambassador, told eight final year students from Myton, Kings High, Warwick and Aylesford sixth forms and their teachers, about progress to eradicate this terrible disease which paralyses children. Most young people nowadays have never encountered it and need to ask their grandparents to understand the fear of infection. In the 1950’s polio was still occurring in Britain and most of the world; even in the 1980’s it disabled over 300,000 children a year around the world. Rotary clubs made eradication a priority and working with the World Health Organisation and national governments set the goal of immunising all the children in the world. Bill Gates joined in, firstly donating 1$ for every £1 raised, and now $2. Margaret herself had been to India immunising children in the slums and seen first- hand the impact of the programme, which has led to only 18 cases being reported to date in 2018. Once a child has received the vaccine its little finger is coloured purple, hence the campaign’s colour. Immunisation will need to continue for another 10 years before we can be sure that Polio has been eradicated, and funds continue to be required. Purple crocus bulbs were planted last year in Puckerings Lane, and many Rotarians were wearing a purple crocus badge to support the campaign. President David Smith wished the students every success in their exams and encouraged them to spread the word and to “Think Big” – no challenge is impossible to achieve when we work together.